During the independence struggle from Indonesia after 1999, more than 75 percent of the population was displaced, and almost 70 percent of the physical infrastructure was destroyed or damaged, and nearly 100% of the country's electrical grid was destroyed. East Timor's political climate remains unstable. 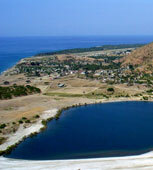 In December 2002, the country hit the international headlines with civil unrest in the streets of Dili, its capital. In January 2003, the country faced alleged militia incursions across the country's border with West Timor. Most recently, President Xanana Gusmao formally requested Prime Minister Mari Alkatiri to step down. Jose Ramos Horta was appointed as his successor on July 2006. East Timor faces land tenure issues like ownership claims of native owners, government's place of relocation for the refugees, implementation of new land policies, and so on.